Geekhood Status High Tech: To show that you are geeky enough keeping up with the evolution of technology. No Typo: The (secretary of the) precipitant of your business card would not have a chance of making typo when digitalizing your contact information. 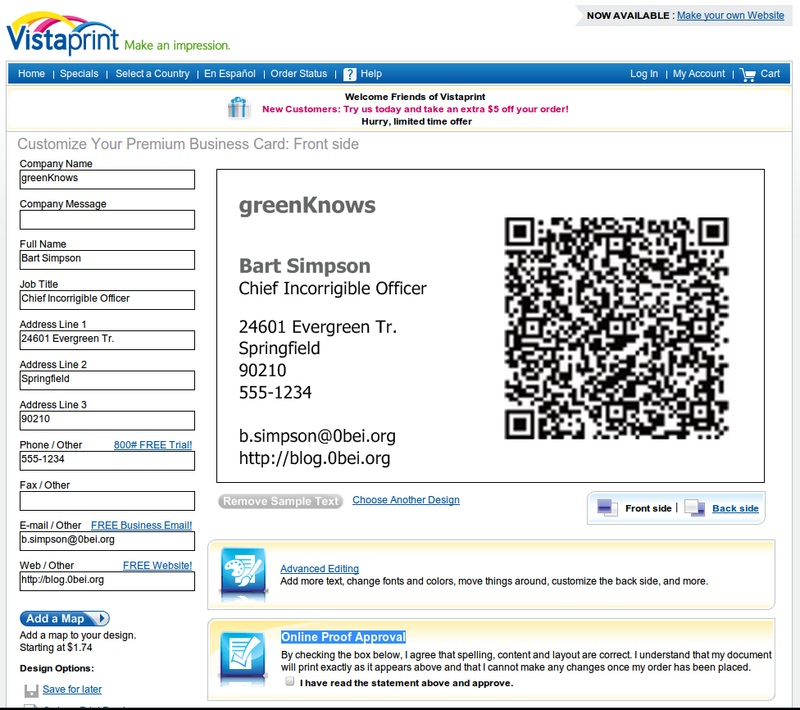 More Incentive: It takes only seconds to scan your contact info from the QR code, so your name is more likely to be remembered before your business card heads for the recycle bin. Follow, but do NOT copy above example. 90210 is definitely not Springfield, even if you were indeed Bart Simpson. The contact info you have just entered is coded into your QR code, and going to be decoded by a QR code scanner later by the recipient of your business card. On your business card, it is not likely to be human readable. At this point, you may try to scan the QR code displayed on your screen to verify the accuracy of your code. 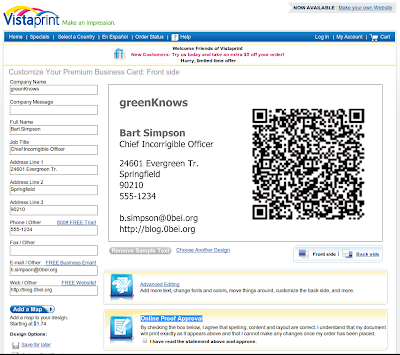 Click [Download], and save the picture of your QR code for later use. Click [Get Started] under [FREE Business Cards]: You need to pay a small amount if you want to include your own picture. In this case, your picture is your QR code. Fill in Contact Info. (Again! ): This time, the contact info is going to be printed on the card, and be read by real humans. It'd better to be identical to the info in your QR code. You need to check this by yourself. 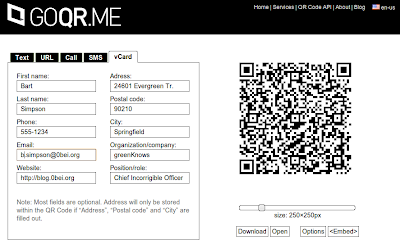 Click [Add Image]: Select the QR code file you downloaded from goqur.me. 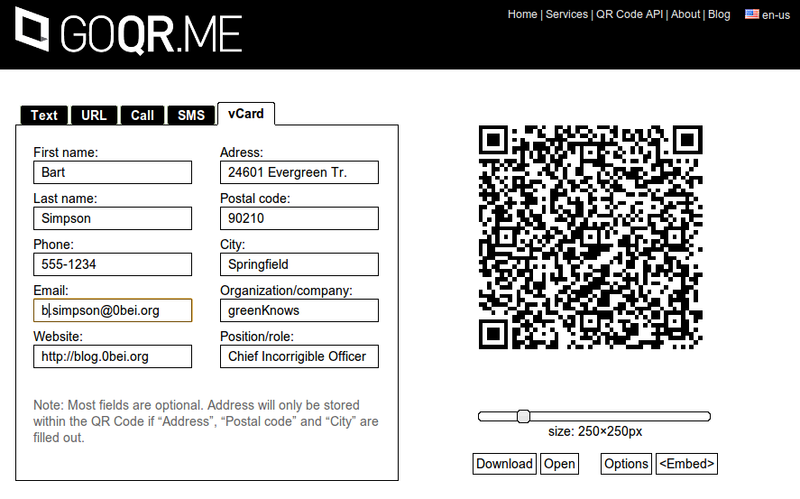 Select a design with plenty of white space around QR code for easier recognition. Click [Remove Sample Text] to appreciate your work, and try to scan your QR Code from your screen again. You can never have too many verifications. Follow the instruction, either sign in, or get an account.